Hormonal disturbances are quiet complex in nature & lead to various disorders. These can lead to cystic ovaries, failure of estrus & repeat breeders due to failure of ovulation. Major causes: Inadequate secretion of FSH & LH hormones. 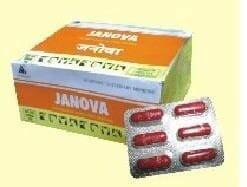 Janova is a scientific combination of medicinal herbs which mimic the action of gonadotropins and synchronies the release of physiological hormones for inducing ovulatory oestrus and regulating ovarian functions. Induces ovulatory estrus by regulating ovarian functions. Orally once daily for two consecutive days .Repeat the same dose after 10 days, in case no oestrus or weak oestrus is observed, following the first treatment. 6 capsules in aluminium foil laminate strip with three capsules in each of the two pockets, packed in a monocarton.